Early Sunday afternoon my son was eager to hit the road after our three days in Carlisle, PA at the Ford Nationals. He was ready to go and a little mad at me that were were staying until mid-afternoon. Truthfully, I was ready to go, too. That was when my phone rang. It was my brother who had attended with us but had the sense to leave first thing on Sunday morning. He was home already. He asked if I had taken a look at the calendar that we all got in our goody bags. No, I hadn't. He said I should look at October 2015. We were in there. Hmmm. So, I did. And, we were. 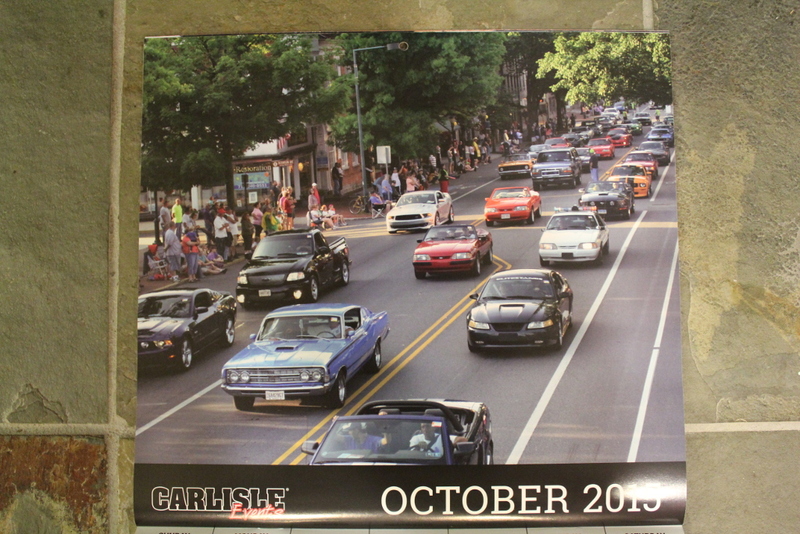 The calendar covers all of the Carlisle shows - not just the Ford show. That's a lot of shows and a lot of cars. Against those odds, our group from last year's parade prominently appears in October 2015. Me in my 1991 ,Mike in his 1992, my brother in his 2008, Tim in his 2007 and 5pt0joe in his Bronco. A little while after my brother told me about this I had text message from a couple other friends about this picture. The word was out. The event staff was nice enough to provide me with a couple extra copies that I requested because Mike and Joe didn't make it this year. What a great surprise. And, what a nice Father's day gift it made for my dad who has two sons (and two grandchildren) in one calendar.